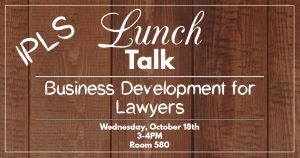 The Intellectual Property Law Society (“IPLS”) is hosting a lunch talk to discuss developing connections and a network, both inside and outside of the legal community, to lay the groundwork that will become the foundation upon which we will build our careers. Adjunct Professor and Kirkland & Ellis Partner, Brent Ray, will be presenting during the lunch talk. Business Development is something that is never too soon to start talking about, so join IPLS and Brent for what is sure to be an interesting and informative talk! We hope to see everyone there!